The pasty is close to the heart of every Cornish person. It doesn't matter how many times you eat one (and trust me, I've had a few over the years!) the sight or smell of a proper pasty will always bring a smile to your face. In 2011 the Cornish Pasty was awarded Protected Geographical Indication, rightfully giving it the same status and protection as other world renowned products like Parma Ham, Camembert Cheese, and Champagne, and ensuring that only a real pasty, made in Cornwall the traditional way can be called a Cornish Pasty. To celebrate this, in 2012 The Eden Project, together with The Cornish Pasty Association, hosted the inaugural World Pasty Championships. Over 100 amateur and professional bakers entered the competition, and more than 3000 visitors came along to enjoy the entertainment and celebrate the Cornish Pasty. 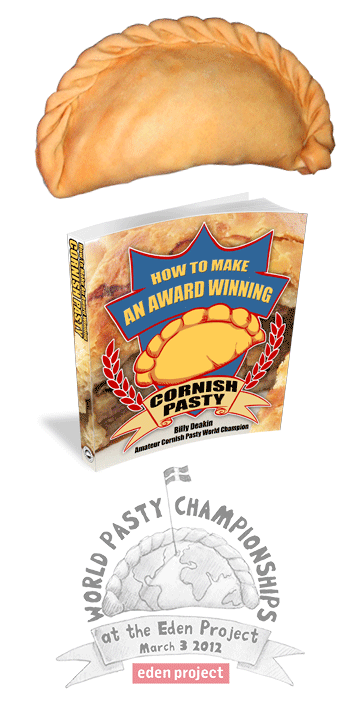 After winning the competition in both 2012, and 2013 I'm now sharing my passion for the Cornish Pasty in my new book - How To Make An Award Winning Cornish Pasty. Please, support the project by visiting the Kickstarter project page or sharing this web site on Facebook or Twitter.